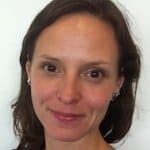 Mary Roach is the outgoing energy access program manager at Ceniarth and the incoming head of global partnerships at Loowatt, a waterless toilet company based in the UK. Prior to joining Ceniarth in 2015, she was responsible for the GSMA’s M4D Utilities Innovation Fund supporting organizations leveraging mobile technology to improve access to energy, water and sanitation. Her interest in the role that infrastructure can play in development emerged from her combined experiences working on the first pilot of M-KOPA’s pay-as-you-go product, five years working with GE Power Generation, and a decade of involvement with Engineers without Borders Canada at home and abroad. She earned a master’s degree in business administration from Oxford University and a bachelor’s degree in chemical engineering from McGill University.